Coach Bob Bertucci called senior Jackie Morrison the volleyball team’s “quarterback.” She excels both on the court and in the classroom. 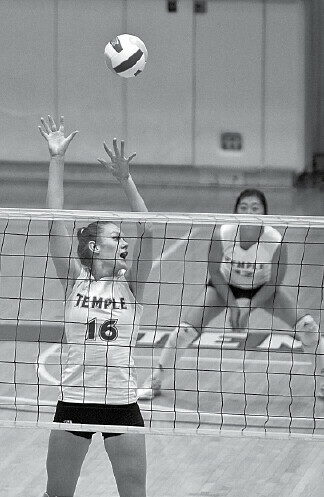 Back in 2006, setter Jackie Morrison was the lone freshman on a senior-laden squad. TTN File Photo Senior setter and team captain Jackie Morrison sets up junior outside hitter Yun Yi Zhang earlier this season. Now, she leads the Owls toward one goal – an Atlantic Ten Championship. The 6-foot-1-inch senior from Stony Brook, N.Y., is quite visible on the court with her bright red hair. But the two-year captain of the Owls said she wants her teammates to take note and approach her off the court for help as well. In seventh grade, Morrison left her soccer cleats behind and started playing volleyball. Three state championship appearances and two state titles show she made the right choice. Morrison led Ward Melville to the New York State Championship in 2003 and 2005 and to a silver medal at the 2005 NY State Empire Games. She still holds her high school’s record for blocks and assists in a single season. The communication science major said she once found herself in a position similar to that of redshirt freshman middleback Jasmine Waters – a newer player to the game looking for help. Morrison turned to Temple alumna Maira Mogollon. And in addition to leading the Owls on the court with 1,147 assists last year, Morrison also starred in the classroom. The Philadelphia Inquirer named her to the Academic All-Area volleyball team. Coach Bob Bertucci can’t seem to have a press conference without somehow mentioning her name. One of those teammates is junior middleback Jessica Antosz. After she graduates in May, Morrison plans to attend graduate school, and though she remains undecided where that will be, volleyball will still play a part in her future. When Morrison leaves Temple’s program next year, someone will have to fill her shoes. She already has a firm idea who that will be. Ganes talks upcoming season and conference move. Team wins five straight, all against conference foes.